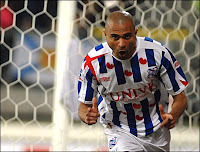 The expected transfer of Afonso Alves from Heerenveen to Manchester City looks to be off after the Premiership side discovered they will have problems obtaining a work permit for the Brazilian striker. City were thought to have already agreed a deal with Heerenveen to sign Alves in the January transfer window, but these issues have put a halt to the deal, with City coach Tord Grip saying: "The deal is at a standstill". Alves, 26, has been capped eight times by Brazil.